By Captain E.D. Swinton, D.S.O., R.E. A classic in small unit tactics in the British and Canadian Armies. I recommend this small book, without qualification, to the modern Infantry soldier. Lieutenant Backsight Forethought (BF to his friends) has been left in command of a 50 man reinforced platoon to hold Duffer's Drift, the only ford on the Silliasvogel River available to wheeled traffic. Here is his chance for fame and glory. He has passed his officers courses and special qualifications. "Now if they had given me a job," says BF, "like fighting the Battle of Waterloo, I knew all about that, as I had crammed it up..."
While BF's task appears simple enough, the Boer enemy causes a multitude of problems, but you, smart reader, with a quick mind and sharp intellect will, no doubt, solve the problem before the first shot is fired. Major General Sir Ernest D. Swinton, K.B.E., C.B., D.S.O., was a noted English soldier, author, scholar and professor. Considered by Field Marshal Earl Wavell as one of the most far-sighted officers the British Army has produced, he wrote before World War I on the effects of air warfare, mining and of psychological warfare. In 1914 Sir Ernest completely revolutionized warfare by his invention of the machine that was to became known as the "tank". He, more than anyone else, was responsible for its early development. He served as Professor of Military History at Oxford from 1925 to 1939, and as Commandant of the Royal Tank Corps from 1934 to 1938 -- earning the rank of Major General. As a Captain, shortly after service in the Boer War, he wrote "The Defence of Duffer's Drift," using the pseudonym. Lieutenant Backsight Forethought, or BF. 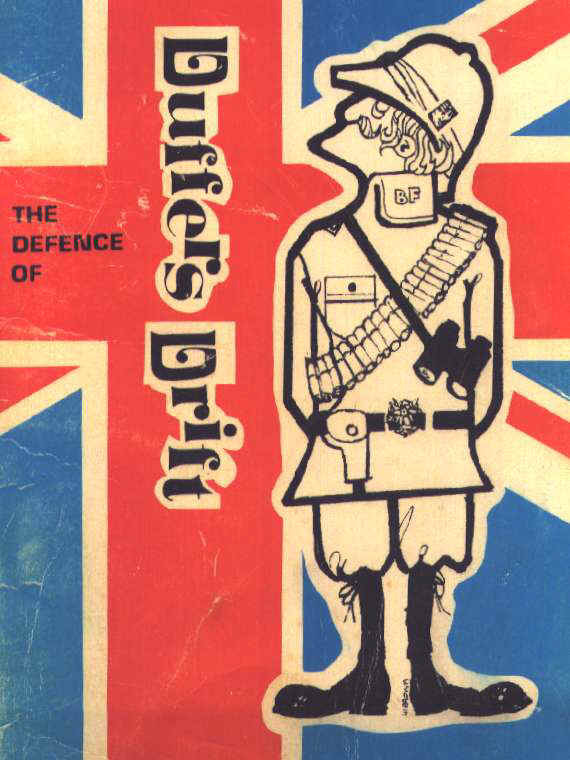 Duffer's Drift has become a military classic on minor tactics in this century. In addition to Duffer's Drift, and contributing to many journals, he authored The Green Curve in 1909 and the great Tab Dope, in 1915, under the pseudonym O'le Luk-Oie (Olaf Shut-eye). His other works include The Study of War in 1926 and his final publication, An Eastern Odyssey written in 1935. The Boers, Dutch for farmer, first settled what is now Cape Province, Republic of South Africa in 1652. After Great Britain annexed this territory in 1806, many of the Boers departed on the "Great Trek" and created the Republic of Natal, the Orange Free State, and the Transvaal. Gradual commercial control by the British and discovery of gold and diamonds, among other things, served to create hostility between the Boers and British, resulting in the South African War or Boer War from 1899 to 1902. The Boers initially outnumbered the British and were well equipped, scoring impressive victories in the areas adjacent to their territories. Even though the Boer armies finally surrendered, apparent victory for the British was retarded by extensive and coordinated guerilla warfare. The war was finally ended by the systematic destruction of the Boer guerrilla units and hostilities were terminated by the Treaty of Vereeniging in May 1902. The Boer territories were annexed by Great Britain and were organized into the Union of South Africa eight years later. ABATIS: A barricade of felled trees with branches facing the enemy. ANT HILL: A large cone-shaped mound of earth. BOER: Descendents of Dutch Colonists in South Africa. DONGA: South African gully or ravine. DRIFT: A ford, a shallow place in a stream or river that can be crossed by walking or riding on horseback. DUFFER: An incompetent, awkward or stupid person. KAFFIR: A fierce black tribe of South Africa (19th Century). KOPJE: A rocky hill or butte of South Africa usually 200- 800 meters high. KRAALS: A village of South African natives surrounded by a stockade for protection. QUI VIVE: Fr., a sentry’s challenge; "who goes there?" SUBALTERN: A British officer holding a commission below that of captain; a lieutenant. VELDT: A grassy plain of South Africa, similar to the Western Tableland of the United States. VC: Victoria Cross, highest British medal for valour. "It was our own fault, and our very grave fault, and now we must turn it to use. We have forty million reasons for failure, but not a single excuse." KIPLING. This tale of a dream is dedicated to the "gilded Popinjays" and "hired assassins" of the British nation, especially those who are now knocking at the door, to wit the very junior. It embodies some recollections of things actually done and undone in South Africa, 1899-1902. It is hoped that its fantastic guise may really help to emphasize the necessity for the practical application of some very old principles, and assist to an appreciation of what may happen when they are not applied, even on small operations. This practical application has often been lost sight of in the stress of the moment, with dire results, quite unrealized until the horrible instant of actual experience. Should this tale, by arousing the imagination, assist to prevent in the future even one such case of disregard of principles, it will not have been written in vain. The dreams are not anticipations, but merely a record of petty experiences against one kind of enemy in one kind of country only, with certain deductions based thereupon. But from these, given the conditions, it is not difficult to deduce the variations suitable for other countries, or for those occasions when a different foe with different methods of fighting and different weapons has to be met.